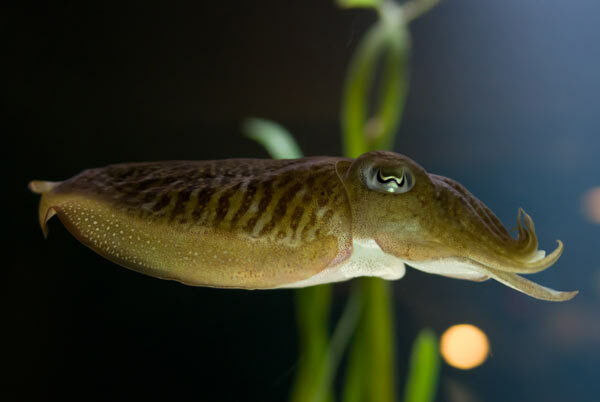 Color-changing cuttlefish are the cool cousins to squid and octopus and among the favorites of Aquarium visitors, but new, super-slow motion video shot at the New England Aquarium reveals a spectacular hunting technique that resembles a scene straight out of an alien invasion thriller. This jaw-dropping, split second footage is the product of the Aquarium’s unique collaboration with an accomplished underwater photographer, an MIT physicist and a Boston area tech company. The slow motion footage, shot at 500 frames per second versus the normal 30 frames for video, shows how these cunning cephalopods capture their food, with two retractable tentacles snagging a fish and pulling it into the grasp of eight waiting suction cupped arms. Video credit: Keith A. Ellenbogen, Allan Adams, Tech Imaging Services, Inc. The shoot was a collaboration between the Aquarium, underwater photographer/videographer Keith Ellenbogen, MIT Assistant Professor of Physics Allan Adams and Jason O'Connell, Vice President at Tech Imaging Services, Inc. out of Salem, Mass. "It's a proof of concept that we can record complex behavior underwater, at high-speed, and in extraordinary resolution," said Adams. "Now that we know it works we're hoping to do more." High speed cameras are not typically fitted with underwater housing, and even when they are it can be difficult to find an area in with enough light to capture super-slow motion footage of marine animals. 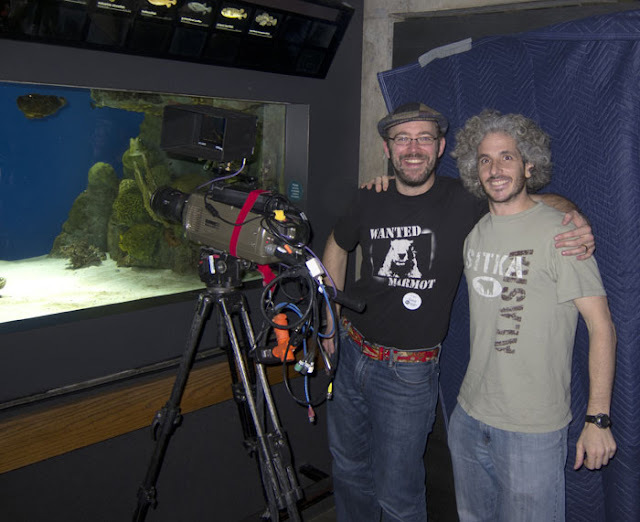 The team sidestepped that problem by filming at the Aquarium, where cuttlefish and other animals are easily accessible to visitors and cameras. 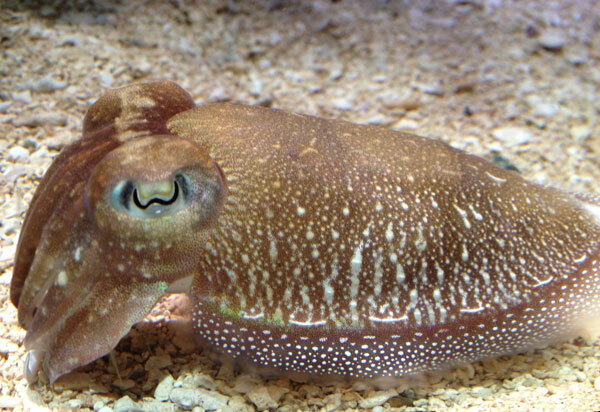 Cuttlefish can change colors to hide from predators. They spent the day mingling with visitors as they set up their equipment outside the Aquarium's exhibits while several animals were fed. The cuttlefish was one of the species that provided some of the most spectacular results. "High speed photography can showcase exotic undersea life from a new visual perspectives," said Ellenbogen. "When we got our first look at the cuttlefish feeding, everyone was blown away with the detail and subtle movements--including things we weren't seeing with the naked eye." This footage was taken at 500 frames per second, about 17 times slower than it occurs to the naked eye. The team used a Photron FASTCAM SA5, which is capable of capturing up to 1.3 million frames per second if there is enough light. A typical video camera records at about 30 frames per second. "I've been doing this for the last seven to eight years, and our company has been around for more than 30 years. I don't think there's footage out there anywhere like this," said Jason O'Connell, Vice President at Tech Imaging Services, Inc. out of Salem, Mass. "In terms of the color and clarity, you would have the impression you were in a submarine underwater with the animal," O'Connell added. "It's like the experience visitors have looking at the exhibit, but slowed down so you can see the details." Awesome pictures especially the cuttlefish ones. I’ve never tried using high-speed photography on our pet fish but will surely try it out if I can get some equipment. The pictures are amazing. The Last Reef 3D — Now Playing!